I'll admit it. Despite the many pizza choices available in my neighbourhood, I get lazy and just settle for Domino's. I'm not dissing Domino's, it is just not very creative. I'd much rather do Hot Oven instead. 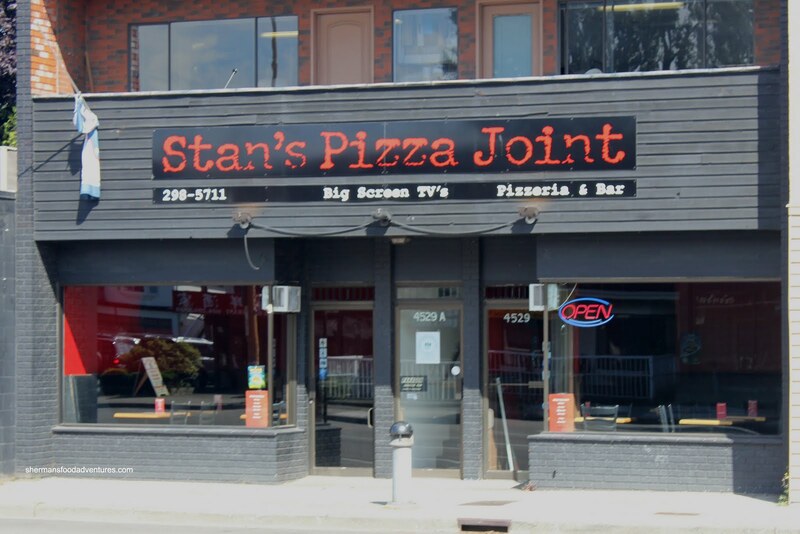 Another option that I finally got to try was Stan's Pizza Joint. It actually took a birthday party for me to sample the pizza. Seeing how we were at Confederation Park, Vandelay ordered pizzas from Stan's (which is nearby). Despite sampling from the 6 different pizzas he ordered, I was not quite satisfied. You see, by the time I got to the pizzas, they were cold. We were too busy riding the miniature train over and over. Hence, I really needed to sink my teeth into some fresh slices to get the full meal deal. 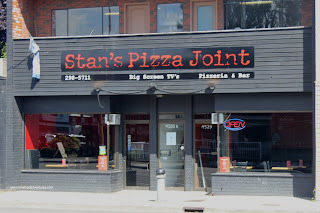 So a bit later, Viv and I ended up ordering 2 pizzas and some pasta from Stan's. I noticed that they had pulled pork as a topping and immediately jumped on that. At least that was something interesting. Thus, for our first pizza, we had Pulled Pork and Tomato. The pulled pork was sufficiently tender and meaty while not over-seasoned. 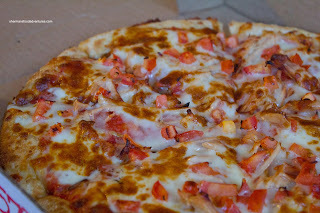 As mentioned, it was a nice departure from the typical toppings found at most pizza joints. We found the crust to be pretty standard a la Gigi's, Sunrise Pizza and the sort. It was not heavy nor thin, it was somewhere in between and not greasy. We liked how it was brown and crisp on the bottom. For our second Pizza I went for Pepperoni and Sausage which was again pretty typical. 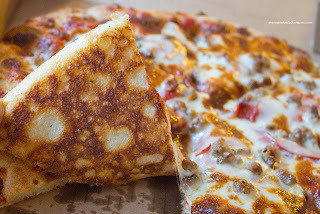 However, the ample amount of cheese (which wasn't too greasy) and liberal application of meat made for a good pizza. Now to get a sense of their other offerings, I tacked on a few orders of their Lasagna and Meatballs. 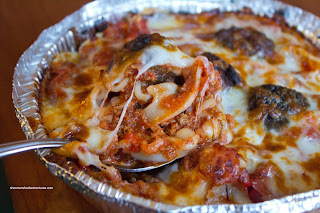 As for the lasagna, it was again pretty typical of a pizza joint offering. The noodles were intermingled with a meaty tangy sauce with plenty of baked cheese on top. Now the meatballs were another story. These were, without a doubt, the worst meatballs I've ever had. And I've eaten a lot of balls! Uh... As you can clearly see in the pictures, the meatballs were burnt. These things were basically inedible. I mean for heaven's sake, they already killed the cow once, why freakin' murder it again??? Honestly, for the person who prepared these and decided to pack it up for a customer to bring home needs a cooking lesson. It is totally inexcusable to serve food that cannot be chewed and digested. Man, these meatballs bring back memories of Kawawa! Okay, meatballs aside, the pizzas were pretty decent and the 2-topping mediums for $7.99 were a good value. The lasagna was okay too considering the price. But it is really too bad the only thing we can take from this meal was the terrible meatballs. 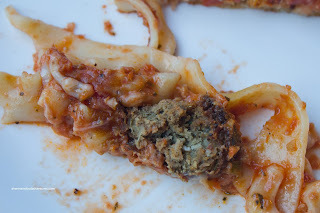 - Worst meatballs we've ever had... can't believe they served them! - Really, how can any cook or chef bring themselves to serve inedible food?? ?